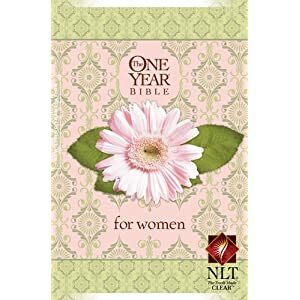 One of the most special Christmas gifts that I received this year was the One Year Bible for Women. My parents gave this to me and I LOVE it! For anyone out there trying to read the Bible in a year, this Bible in particular is for you! It's already broken down into all 365 days of the year, how fantastic is that! You don't have to pick and choose what you're going to read each day and where you're going to start and finish because that's already done for you! When you start each day consist of passages of a Genesis, then Matthew, then Psalm, then Proverbs, and it will continue on. It takes between 10 and 15 minutes to read through each day. And I'm kind of weird about writing and highlighting in my normal Bible (strange, I know) but now that I have this one I don't mind one bit and I enjoy being to go back and read things that caught my eye the first time. Also, this Bible is soft cover so you can bend back the cover and such while reading. I have been doing my reading since the beginning of the year and I have enjoyed it so much! My mind has really gone deeper into the stories and messages that I read through each night. It has sparked new interest in me and made me think more about the Bible and what lies on the pages more than ever before. Go get this Bible! Mine came from Lifeway.